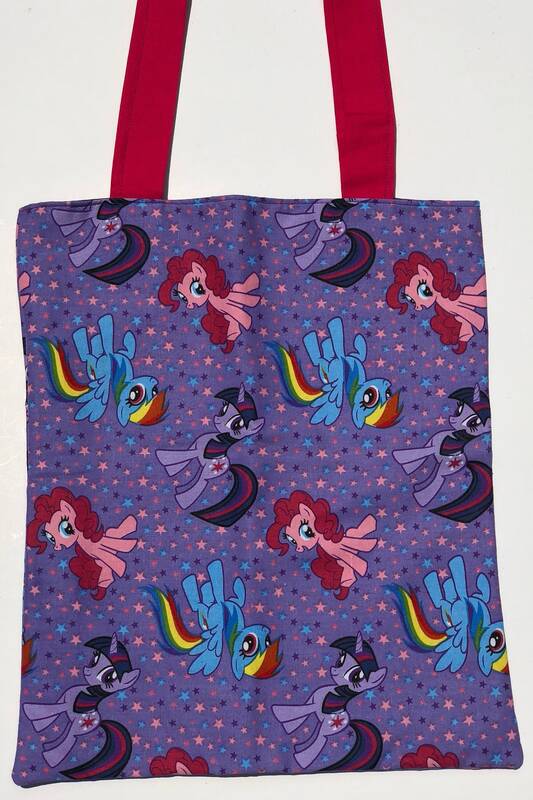 This tote bag was made using purple My Little Pony fabric. I gave the bag a solid purple lining and magenta straps. The bag is just a simple rectangle design. No pockets, nothing fancy. This design has been discontinued. This bag has been serged, topstitched, and interfaced for durability. Skeleton Appliqué Zipper Pouch - Guitars, Top Hat, Bow Tie, Stars, Rock Star. Monster Magnet Set - Silly Monster, Stars. Large Unicorns Zipper Pouch. Rainbows, Sparkles, Glitter. Skulls, Safety Pins, and Polka Dots Zipper Pouch - Punk, Patchwork, Upcycled. Zombie Apocalypse Skater Skirt: Extra Small.